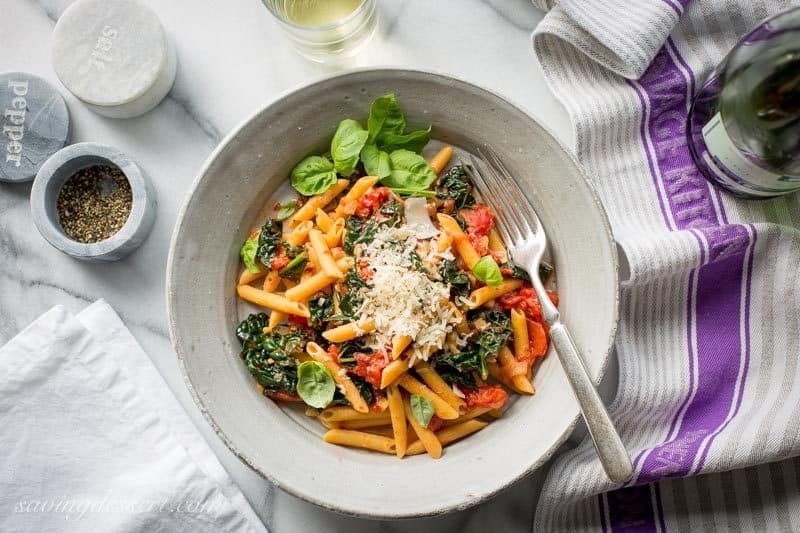 Spicy Pomodoro Sauce with Kale & Penne Pasta ~ a flavorful and healthy meatless Monday meal that will leave you full and satisfied. With just a few healthy ingredients and about 45 minutes, you can enjoy this spicy and delicious dish, and feel good about eating it too! Made with our favorite gluten-free, organic, non-GMO, vegan Chickapea Pasta. I know you must love a quick, inexpensive, healthy and delicious dinner as much as we do. Simple meals, and recipes, are often the best. No complicated processes or special equipment needed here, just plain old good, quick cooking. If kale is not your thing, try substituting Swiss Chard or add some fresh spinach in at the end. Pomodoro is Italian for tomato, and Pomodoro sauce is typically a chunky tomato based sauce simply made by cooking down whole, peeled Plum tomatoes. I added in a few sautéed shallots, along with minced garlic, crushed red pepper and fresh herbs. 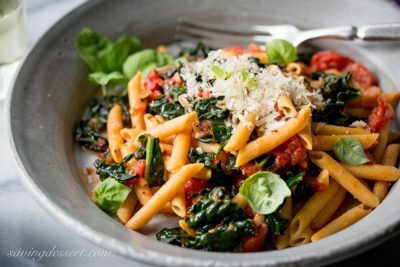 The hardest part is waiting for the tomatoes to simmer into a nice thick sauce before adding the kale and cooked pasta. Top with grated Parmesan, fresh ground black pepper, and basil leaves, then serve immediately. Done and done! Any kind of pasta will do, so just use your favorite. The leftovers keep well and are even very tasty served cold. 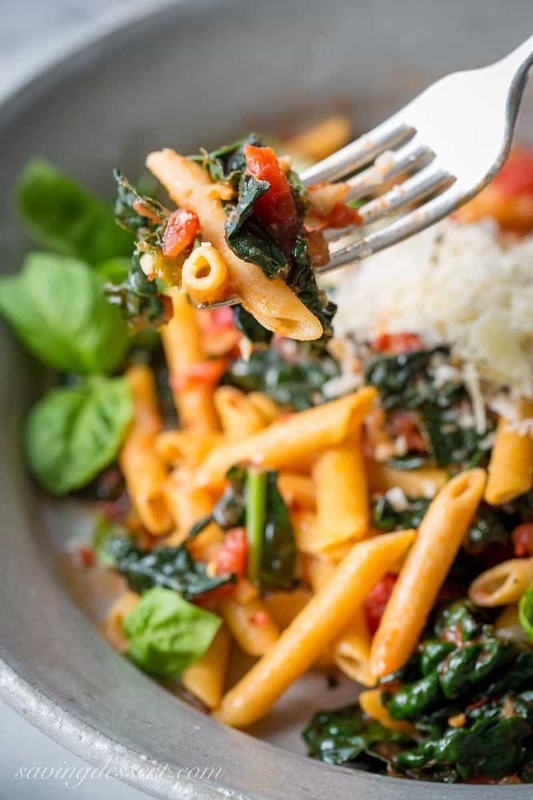 Spicy Pomodoro Sauce with Kale and Penne Pasta – quick, easy and delicious! A flavorful and healthy meatless Monday meal that will leave you full and satisfied. With just a few healthy ingredients and about 45 minutes, you can enjoy this spicy and delicious dish, and feel good about eating it too! In a large non-stick skillet, heat olive oil over medium heat until shimmering. Add the parsley, basil, and thyme. Cook for about 5 minutes or until the herbs are crisp. Remove and discard the herbs using a slotted spoon. Add the shallots to the olive oil and sauté for a few minutes until tender. Add the garlic and sauté for 1-2 minutes, or until fragrant but not browned. Add the crushed tomatoes, red pepper flakes, and black pepper. Bring to a simmer, reduce the heat to low and cook until the tomatoes break down and the sauce thickens, about 25 minutes. While the sauce is cooking, prepare the pasta according to package directions. Drain and set aside until needed. Add the kale to the Pomodoro sauce and cook, stirring occasionally, until wilted, about 5 minutes. Add the drained pasta and cook until heated through. Season with salt and pepper. 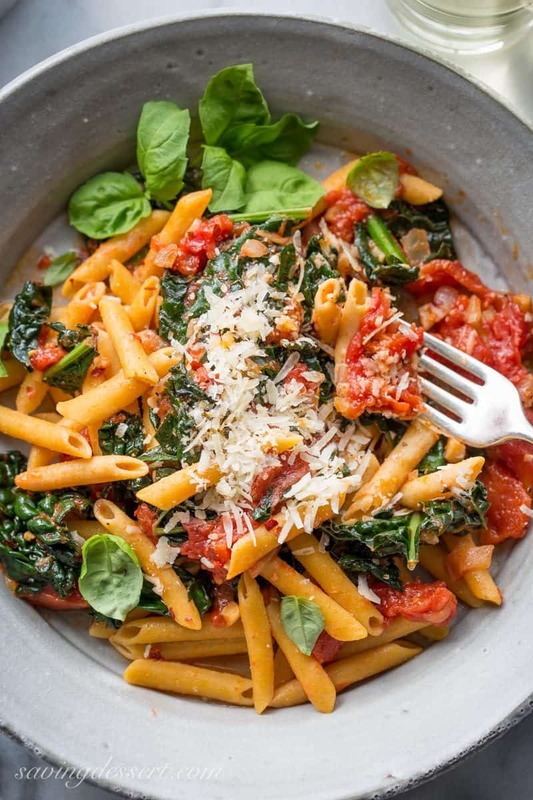 Spoon into bowls and garnish with fresh torn basil leaves and grated Parmesan. Substitute Swiss chard or fresh spinach leaves for the kale if desired. If using spinach it will only need to cook for a minute or two. For this recipe I used Tuscan kale. When crushing the whole canned tomatoes by hand, place them in a deep bowl and carefully squeeze the submerged tomatoes with clean hands. Take care not to squirt yourself with the juice. Also don't wear a white shirt while crushing the tomatoes, just saying. Use your favorite pasta cooked al dente. For this recipe we used Penne Chickapea Pasta made with chickpeas and lentils. SRFD has not compensated for this post, but did receive the penne as a gift from Chickapea Pasta for testing purposes. All opinions and text are my own. Now my stomach is really growling 🙂 What a beautiful plate of pasta, Tricia. 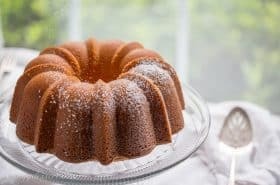 Since returning from vacation, we’ve been trying to eat low carb but this is going on the menu as soon as we reach our goal! Vacation?!?! How wonderful – I hope you went somewhere warm 🙂 Can’t wait to see photos and read all about it. Thanks! Love simple dishes like this one! I bet it tastes amazing! Love the added spices in there too. 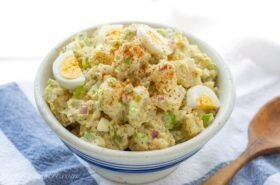 Great dish for an easy dinner! 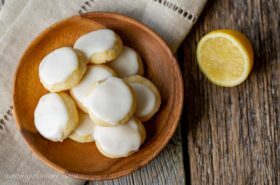 It is just super easy Anna – filling and healthy to boot! Have a terrific weekend and thanks so much! Dark greens and pasta are a terrific combo, aren’t they? Love the spicy flavor of this. But then, spicy anything speaks to me. 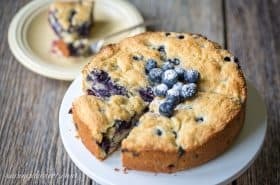 🙂 Nice recipe — thanks. I agree John, especially about a little extra spice in our dinner. I love a flavorful dish and this one hits the mark! I love a spicy pasta! Perfect for a yummy weeknight meal!!! Meatless, tomato-y pasta is totally my game right now. This looks PERFECT!!! Me too Karen – thanks! This looks great! A great weeknight meal. Thanks for sharing. Thank you Velva – hope you’re doing great! Your penny pasta with all those healthy veggies looks very good. I have never tried chick pea pasta , it must have a nice flavor. Hello Gerlinde! This pasta soaks up all the flavors of this dish so it does taste wonderful. So hearty too! Hope you get the chance to try it someday. That is one awesome-looking plate of pasta! 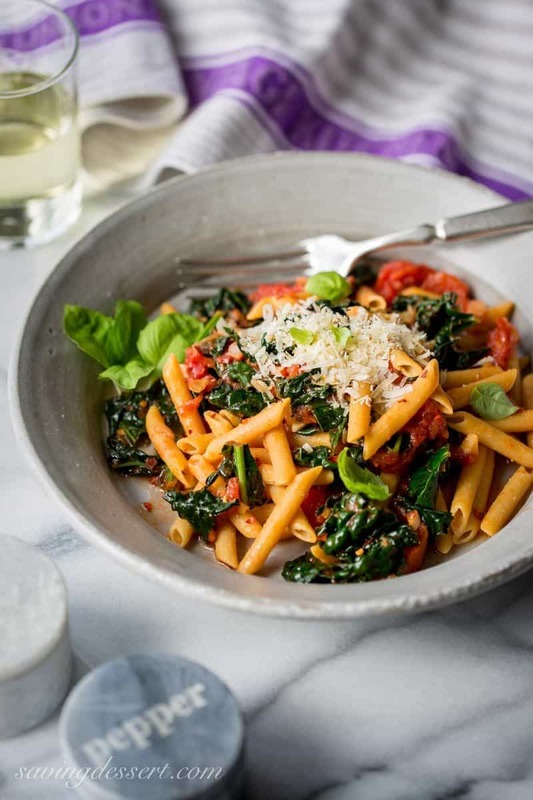 Love it and it sounds like a great, healthy way to satisfy that pasta craving (which we all have so often!). I have to really look into trying a variety of pasta types out there beyond just whole grain. It’s amazing how far we’ve come. Thank you Monica. Chickapea pasta really does curb that pasta craving in a much healthier way. Hope you find some in your stores soon. Thank you! What a fabulous meal Tricia, love all the fresh herbs you have added. Have this chickpea pasta on my list to try. We had a lentil pasta last week and it was wonderful. Happy Monday to you!! I hear you and understand about kale Pam. Swiss chard seems to be a good middle ground so maybe you could try it in this dish. Thanks very much for stopping by and commenting! Thanks Sue! 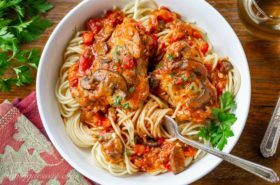 The Chickapea pasta is great with this sauce. It really soaks up the flavors. Have a terrific week and thanks for sharing! You make simple dishes look really stunning, Tricia. It’s a tasty bowl Jennifer – and I bet you would enjoy it too. I love bold flavors and this one does not disappoint. Thank you! Oh my gosh, Tricia, I’m crushing on this beautiful dish. Pomodoro sauce is one of my very favourite and when you add Chickapea pasta, it’s even better.